Each year, Winchester Cathedral’s Education centre invites all the Diocese’s Church Primary Schools to send their final year (Year 6) pupils for a day’s learning about the Cathedral and its activities, culminating in a ‘Leavers Day’ service. This year over three days in June, more than 1,600 children from 50 schools each took part in two morning ‘workshops’ split into groups of no more than 20 pupils. An army of cathedral volunteers organised activities including brass-rubbing, calligraphy, gargoyles, stone-carving, and tapestries, but this year a new addition was the provision of three types of bell-ringing workshops. To get to the ringing chamber the children had to climb some 140 steps, starting with the turret at the west end of the nave. This took them onto the roof parapet and through a door in the roof to the roof space above the vaulting. Here a walkway runs from the west end, some 350 feet to a doorway in the central tower which opens into the ringing chamber. After a demonstration of change ringing by a Guild band, children were given a brief introduction about how bells were rung, which included a live TV display of one of the bells being rung, and safety precautions (basically ‘don’t touch any ropes!’). This workshop was held in the North Transept under the supervision of the Guild’s Education Officer. Children were taught how to hold a handbell so that they could strike it on both up and down strokes. It is very important that the bells are not knocked against each other or other hard objects (particularly by dropping on stone cathedral floors!) since the soundbow can crack requiring the bell to be re-cast at great expense. Children were shown the basic principle of ringing changes as shown in this diagram, and the picture shows them simulating this. The lowest number is the highest note and the highest number is the lowest note, so ‘I,2,3,4,5,6,7,8’ is an octave scale played from highest note to lowest. As the pictures here show, a mobile ring was hired from Lichfield and erected on the Close lawn. 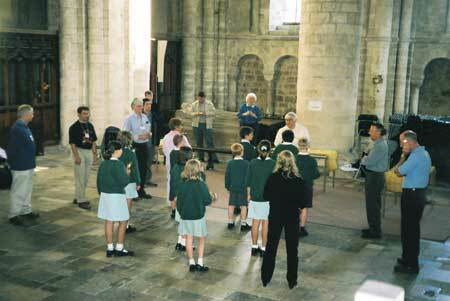 It was of great interest to the school children and the many other visitors to the cathedral. Guild ringers provided demonstrations and children were invited to try their hand under supervision. The workshop also included ‘walking the changes’, where the children were each given the number of a bell and had to change places in rows on the lawn, just like the diagram above. Once again this enabled them to understand the principle of how English church bells are rung every Sunday.